Before putting the weight into service, replace the natural rubber pads on the SUTHERLAND Rub Tester base with the silicone pad furnished. Peel the cloth cover from the adhesive and apply the pad directly to the clean base. 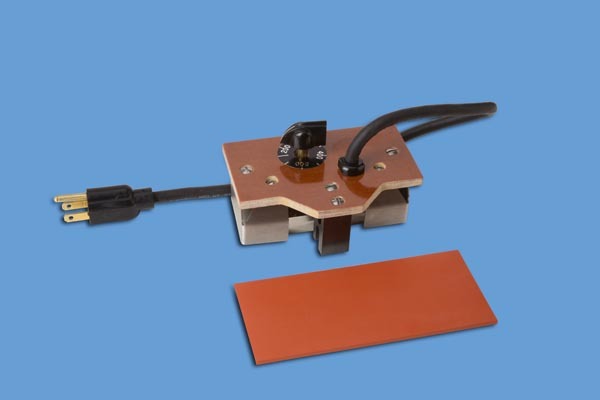 The heated weights are capable of testing from 150ºF - 500ºF. The lamp in the end of the heat shield functions with the contacts in the thermostat. “Templesticks” or a pyrometer may be used to occasionally check temperature control knob settings. When using the weight, have trichlorethylene or similar fireproof solvent and toweling handy for removing foreign material from the heated shoe between tests. Test each sample at 200°F, 300°F, 400°F, 500ºF and with 10 and 20 rubs at each temperature. Start the machine oscillating at once after placing the heated weight on the sample and remove the weight immediately after oscillation ceases. The tested specimens may be rated for wear and smear using a scale of “none, very slight, moderate, and severe”. Consideration must be given to the time interval between printing and testing, as well as to the cleanliness of the surface of the sample. Note: This procedure does not purport to address safety problems, if any, associated with its use. It is the responsibility of the user to establish appropriate safety and health practices. Click here for the FAQs regarding using heated weights with the Sutherland Rub Tester.